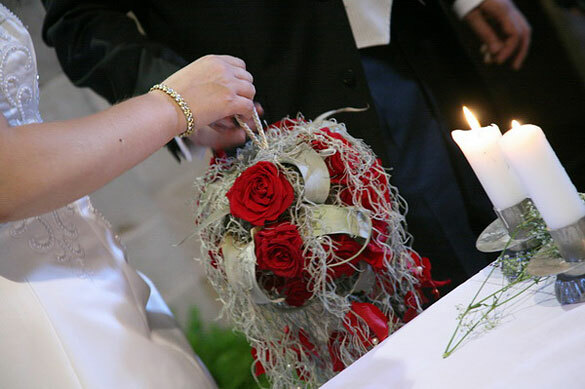 Red is for sure one of the trendiest color for Weddings in these last few years. We had it as theme color on many weddings but among all we would like to remember a special one: Paola and Gianluca’s wedding! 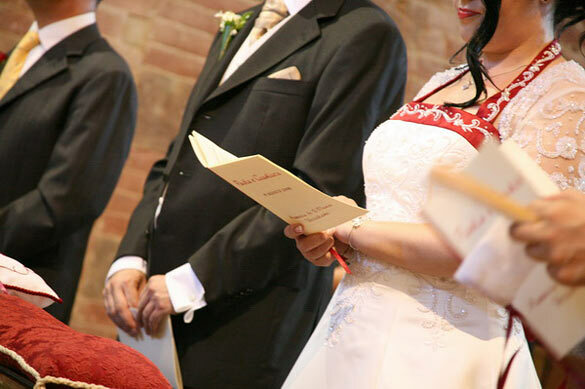 Paola is a Medieval history professor in York and wanted to reflect her passions on her wedding. 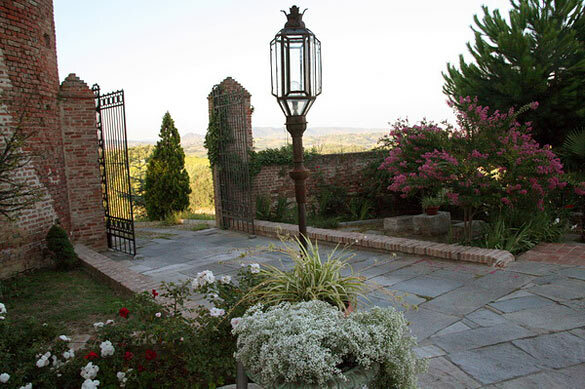 Paola and Gianluca opted for Piedmont countryside for two main reason. First of all even if they live in York they come from Italy, Piedmont in particular. Second in this lovely region you could find many Medieval castles, churches and setting…and that was what Paola really wanted. Paola was a wonderful bride she started planning the event one year before and had all the time to discuss and think about every single detail. It was a pleasure working with her. 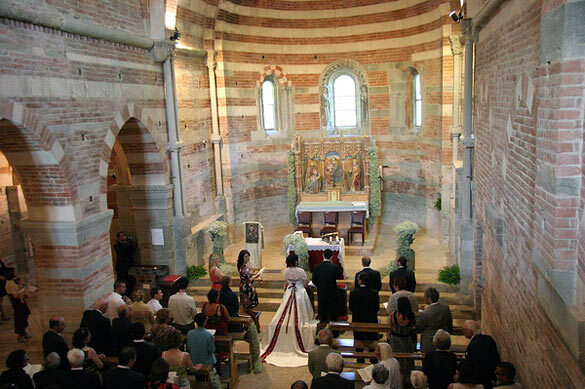 She firstly decided for the church. 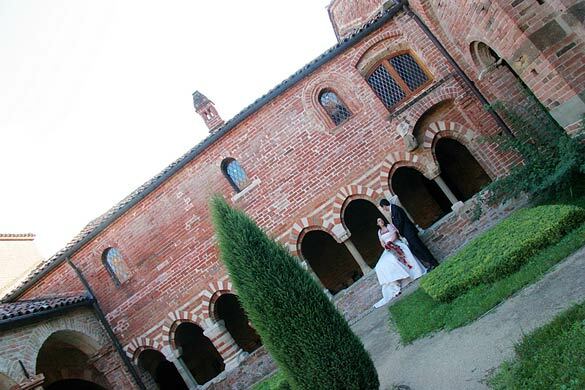 Paola and Gianluca ceremony was held ina wonderful Medieval abbey on Monferrato hills. 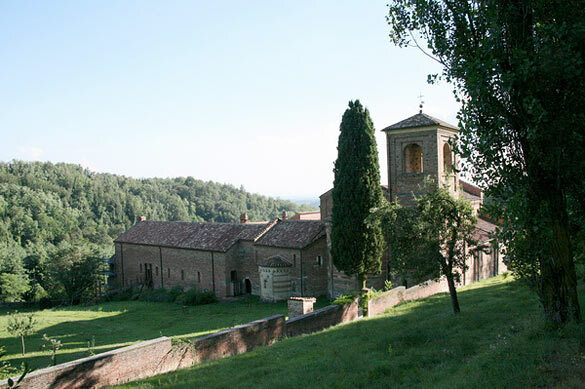 Abbazia di Vezzolano is in a secular park overlooking a great natural view. 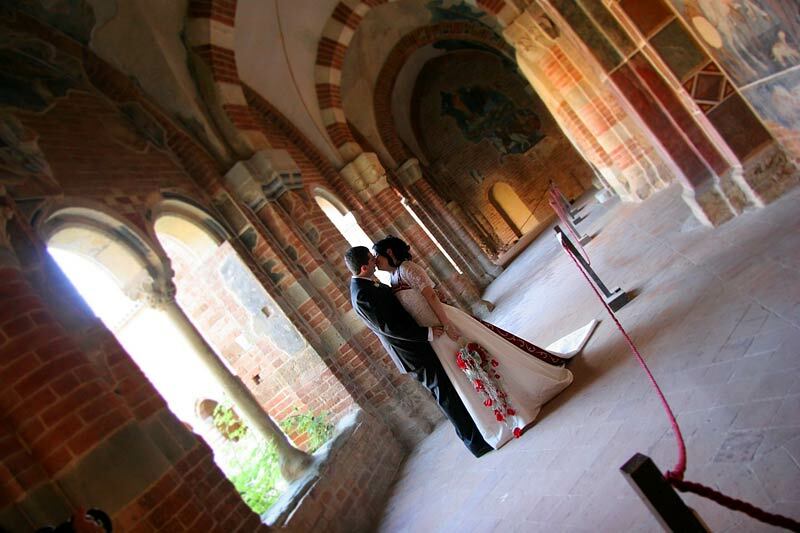 Then Paola and Gianluca decided for the reception venue: Castello di Cortanze. 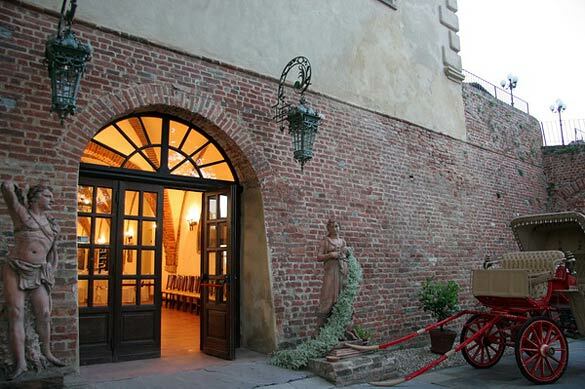 We already told you about this wonderful venue. 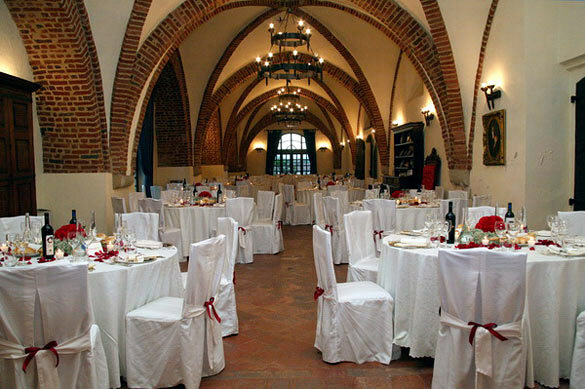 Paola fell in love with that for its Medieval features, walls, tower and armory room where dinner was served. After the enchanting ceremony while guests were tasting a lovely aperitif by the church they took some wonderful pictures in the courtyard of the church taking for them some very romantic moments. The all the party moved to the castle. 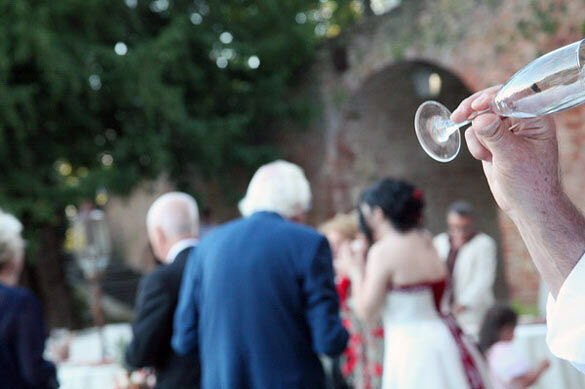 Thanks to great sunny day they had the occasion to enjoy a wonderful aperitif in the courtyard of the castle tasting a wonderful buffet and playing with a little game Paola arranged for her guests. She studied for every single guest a little have-a-guess game which solution could lead each of them to their seats. For the ones who couldn’t guess …a nice table chart was placed on the entrance of the reception room. 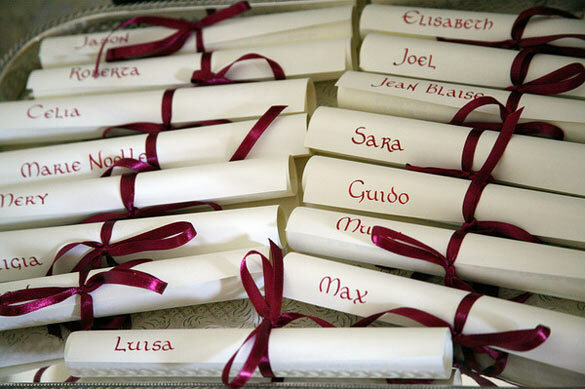 We have to remember that table chart, table names and names cards were all hand made and hand written with red ink with a Medieval font recalling antique book miniatures castle decorations and ancient velvets . Just amazing. 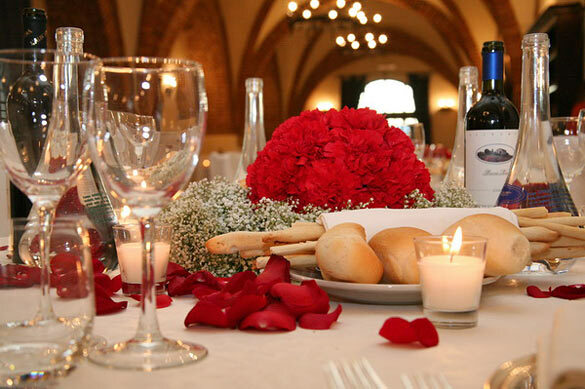 As mentioned reception was held in the armory room of the castle, wonderful white tables and chairs hosted a delicious dinner and lovely flowers decorations made of red carnations and gypsophila. Of course red Piemonte wine and great food made all guest happy to be there! Before telling about the end of the reception in the upper courtyard of the castle we would like to spend some words about wonderful Paola’s dress and bouquet. 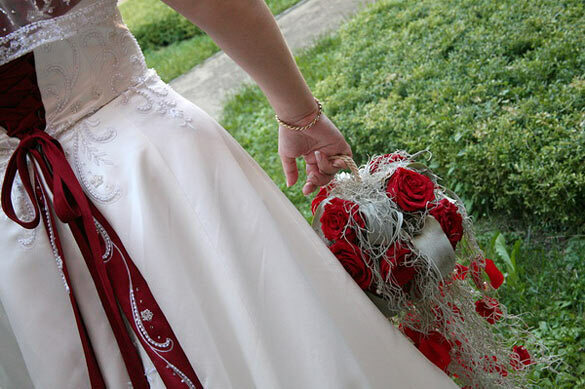 Bridal dress was simply amazing, she bought it in United Kingdom and matched perfectly the theme of the wedding. It was ivory with deep red details on the back and on the train. The decoration on it just recalled the medieval style and the Grand Prix roses she had in her black hair. Paolas’ bouquet was an unusual pomandier. She wore it like a ring with a ball of grand prix red roses and some wires of greenery and pearls. A work of art. 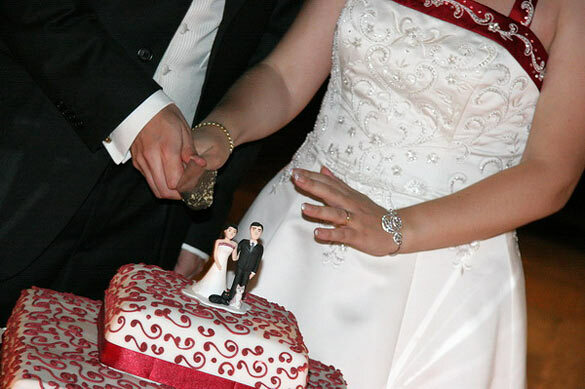 For the after dinner party bride and groom moved to the upper court yard where wedding cake was cut and served. 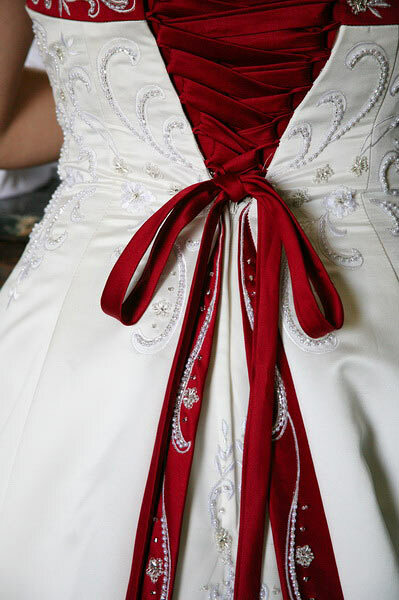 It was ivory and red and perfectly matched Paola’s dress. Also cocktails were red. Paola and Gianluca wanted for their open bar a selection of only red cocktails, everybody enjoyed it. 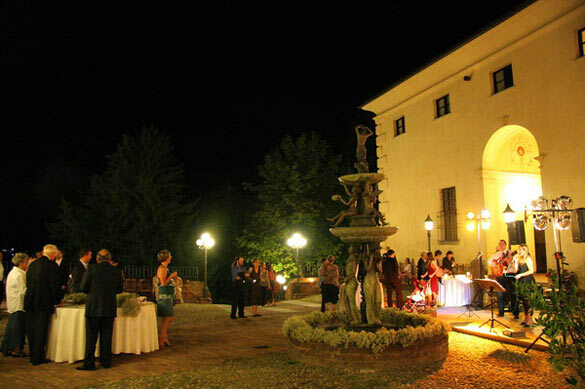 Sugar almonds tasting, petals and jazz music for a wonderful night on Monferrato hills. A wonderful event for a wonderful couple, they surely deserved it! All Images © Estella & Diego – PHOTO27.COM © All rights reserved.